The MAS-04 is an economically priced and flexible device for stationary stud welding. It is adaptable for different welding tasks (e.g. with x-axis, workpiece turning device) and can be equipped with various workpiece mounting devices (e.g. movable workholding device, turntable). The MAS-04 offers the perfect, precise and customized solution for a multitude of individual customer requirements. 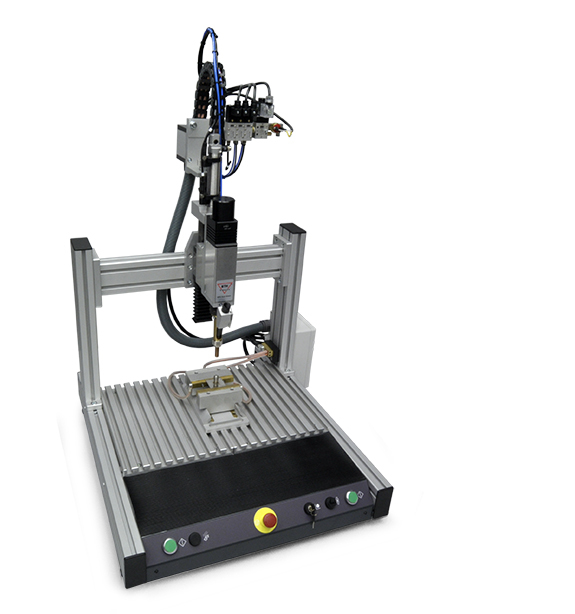 The tabletop stud welding machine is ideal for the cost-effective serial production of small parts. It stands out by the highest precision in the positioning of welding elements and its ease of use at the same time. The MAS-04 is applicable for all stud welding methods. It can be operated with the entire range of our stud welding units and our automatic welding heads KHA-200F and KKA-200F. Stud feeding is carried out automatically (by the automatic stud feeder VBZ) or semi-automatically (by manual insertion). Optionally, the MAS-04 can be equipped with a safety housing with light curtain or door.